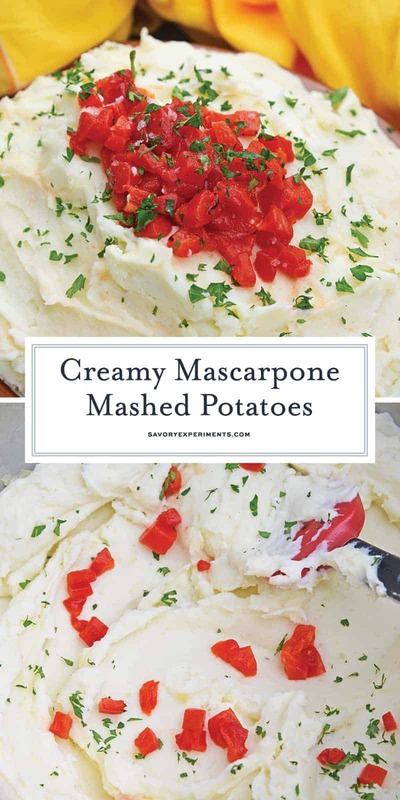 Mascarpone Mashed Potatoes - The Best Mashed Potatoes Ever! There is nothing quite like homemade mashed potatoes, but those can become bland. 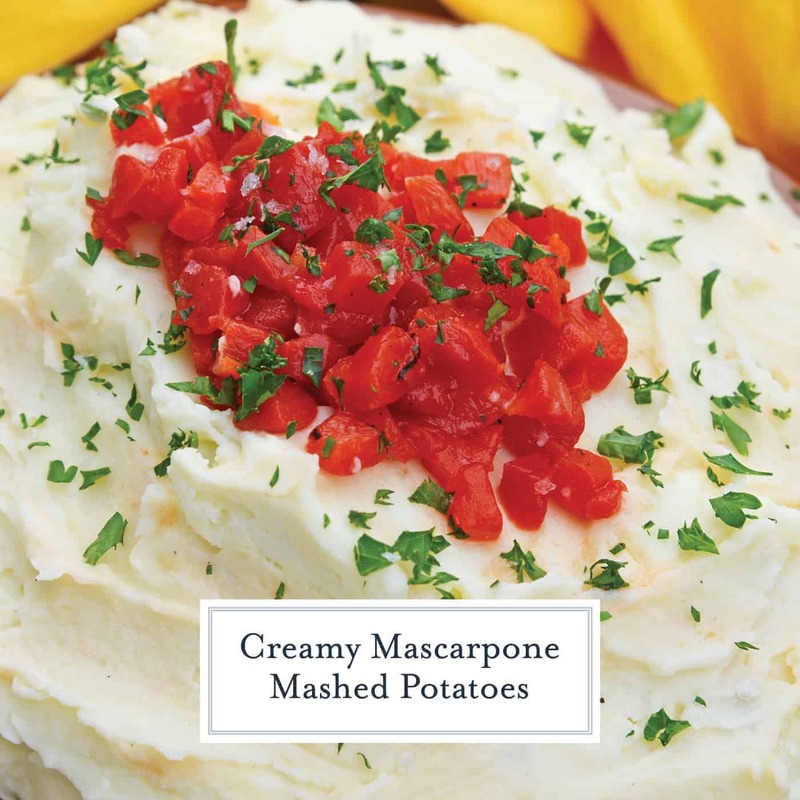 Mix it up by using some new ingredients, like mascarpone and roasted red peppers, to make these Mascarpone Mashed Potatoes … the best mashed potatoes recipe! 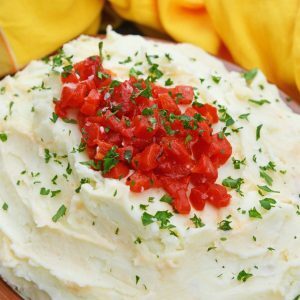 Mascarpone Mashed Potatoes take traditional mashed potatoes up a notch by adding creamy mascarpone and roasted red peppers! Oh, mashed potatoes. If you read my blog with any regularity, you know my obsession with potatoes.I love spuds. They are a blank canvas waiting to be painted. What makes the best mashed potatoes recipe? For me, they are fluffy and soft, nearly pillow like, with the taste of potatoes, but also the creaminess of butter and cream. For this mashed potato recipe, the creaminess comes from mascarpone cheese, whole milk and butter. This is one of those times when you don’t skimp. Do not use reduced fat ingredients for this recipe. Take the night off from your diet and indulge in these perfect potatoes. Have you ever spent the time to peel, dice and boil your perfect mashed potatoes and then, bam, you pour in a little bit too much milk , cream or butter and now you are left with a soupy mess? I always try to add slowly so I don’t hit this critical point, but it can be hard to estimate prior to whisking or ricing. But you are in luck, I have a simple cheater tool for you: instant mashed potatoes. Personally, I do not care for dehydrated potatoes flakes, but they are a fast fix for loose mashed taters. Just add a small amount until your mashed potato masterpiece reaches the optimal consistency. Not too sure how to make homemade mashed potatoes? The good news is they aren’t hard to make! All you need is some potatoes, milk, and butter, and you’re ready to go! Peel and chop up your potatoes and boil them until soft. Next you mash them up and add in your milk and butter and just whisk until smooth. Short on time? 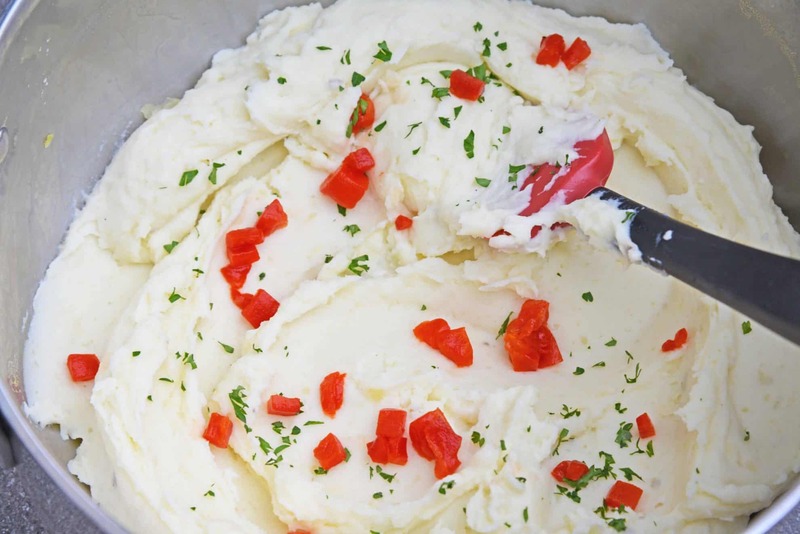 You can also make Mascarpone Mashed Potatoes using all instant mashed potatoes by cooking according to package directions, omitting butter and milk from this recipe and picking up with the mascarpone, roasted red peppers, salt and parsley. – Great for making smooth mashed potato recipes, but also great for deviled egg filling! – I use this gadget for so many things, but of course, it is great for the best mashed potatoes. – I love my stand mixer, but for some things, like whipping mashed potatoes in the same pot I cooked them in, an electric hand mixer with the whisk attachment works perfectly! What are the best potatoes to make mashed potatoes? There are many potatoes out there, over 4,000, in fact. The most common in the states are red potatoes, Yukon Gold, Russets, new potatoes (baby potatoes) and of course, sweet potatoes. All potatoes have a different starch content, texture of flesh and skin so certain potatoes are better for certain things. Peeled Russet or Yukon gold potatoes have a higher starch content and are therefore the best base for fluffy homemade mashed potatoes. Can you freeze mashed potatoes? You can freeze mashed potatoes! They do best in an airtight plastic bag with as much air as possible removed from the bag. There is still a lot of water content and they lose a little richness, so they might need a little TLC when thawed. Additional butter or a few tablespoons of sour cream will work wonders. How long do mashed potatoes stay good? If kept chilled, for up to 4-5 days. Are mashed potatoes gluten-free? Basic mashed potatoes are gluten free, however it depends on what you add to them after that can tip the scales. This recipe is, indeed, a gluten free mashed potato recipe. Are potatoes healthy or good for you? I am really starting to loathe the term “healthy”. It is defined by everyone differently. Potatoes do have some health benefits including being low in calories, fat-free, low sodium and cholesterol, high in potassium and good source of B6 and fiber. 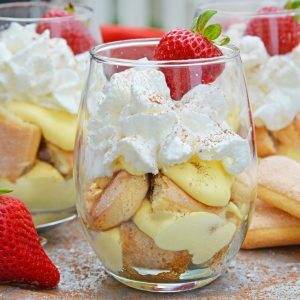 This recipe, however, has full fat milk, butter and mascarpone cheese, which aren’t notoriously healthy ingredients… so… you make up your mind whther this is “healthy” or not. Fill large pot or Dutch oven with water and salt with 1 tablespoon fine sea salt. Add potatoes and bring to a rolling boil over high heat. Stir occasionally until potatoes are soft and can easily be mashed, approximately 15 minutes. Drain in a colander. Return potatoes to the same hot pot or Dutch oven. Using a ricer or potato masher, mash potatoes well. Residual water will aid in the process. Whisk in butter, mascarpone and whole milk. 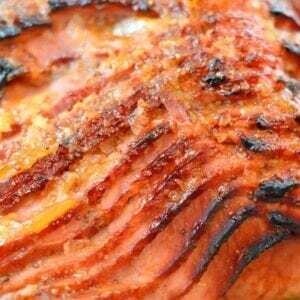 Potatoes should whisk easily, but if you like smooth as silk taters- use an electric hand mixer. Mix until blended. You might need a little more milk to reach desired consistency. Using a spoon, fold in roasted red pepper, parsley and salt. Serve immediately and piping hot. 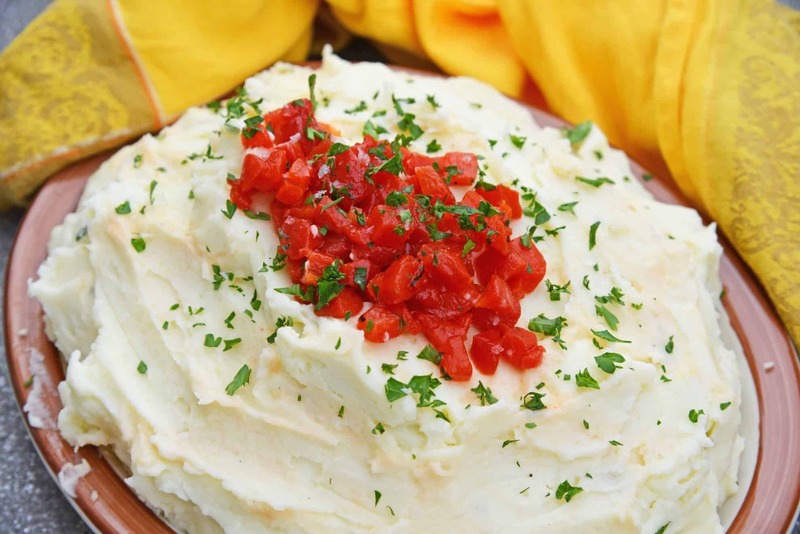 Enjoy your Roasted Red Pepper and Mascarpone Mashed Potatoes! I’ve never tried this combo in my potatoes, but I always jazz them up a bit. Thanks for the suggestion. Just mascarpone is still deliciously divine. These sound yummy. With the exception of the red peppers. Oh I have a love/hate relationship with mashed potatoes! These look divine, and I think they’d actually make a great meal by themselves! I’ve heard wonderful things of mascarpone cheese. Would it be ok to substitute with something like cream cheese in case you couldn’t get your hands on the other stuff? Oh sure- cream cheese would work just as well. 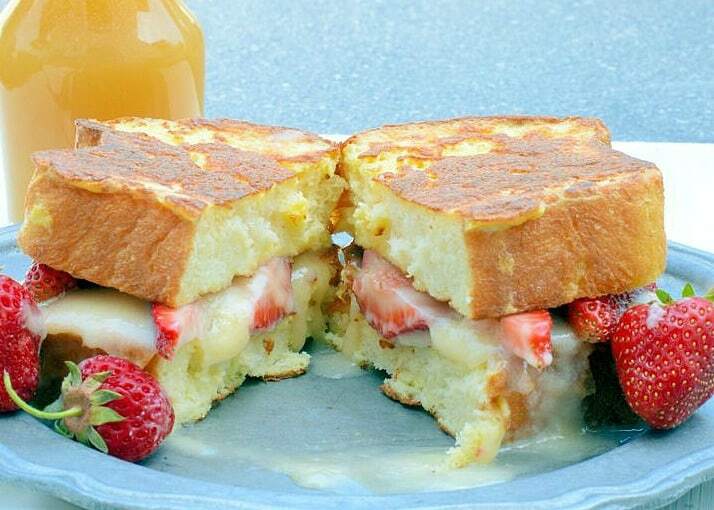 I definitely want to try this, it looks yummy! I don’t like mashed potatoes and I’m looking for a way to spruce it up so I will like them. This might be it since I’m such a cheese lover. That looks and sounds absolutely delicious! I’m not sure that I’ve ever had mascarpone cheese before, and I think every time I’ve heard it used is in a sweet treat. I’m so curious to try this! I love mashed potatoes and my husband could literally eat potatoes everyday! Can’t wait to give this a try! I love mashed potatoes! I’ve never made them like this before though. What a tasty recipe! This looks delicious! I can’t wait to try these! This is really a great post and another way to enjoy mashed potatoes! I’m so admiring you now for that original recipe. You definitely had me with the addition of the roasted red peppers. This looks GREAT! These potatoes look amazing! I never would of thought of this combination myself. Your so creative! I love variations on mashed potatoes. I have a recipe that calls for sour cream and I absolutely love it. 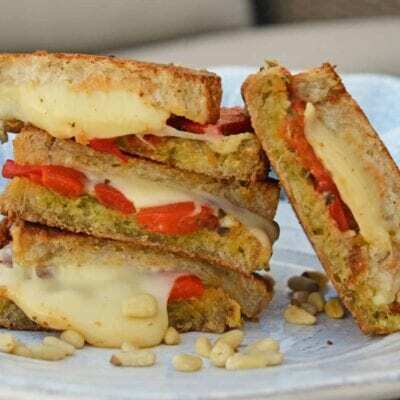 This recipe also looks great! I have never used mascarpone when it was not in a dessert. These potatoes sound so good! I never thought about trying mascarpone. This looks delicious! I’m definitely adding it to my meal plan! you had me at roasted red peppers. so good. OMG, I was just at the Italian store and bought Marscapone from Italy last week! Some people were just dipping bread in it and I was mesmerized! I’ll bet it is great in your dish above! Yum, what a delicious idea! I LOVE me some mashed potatoes, never would have thought for this combo. It sounds mouth watering, I want some this instant! I’m a new fan to roasted red peppers. I like them in my pastas now. I have added cream cheese to my mashed potatoes before. I am sure that we would love this recipe! Yum. We LOVE a good side dish of mashed potatoes, and boy do these look off the hook. This looks so delicious! 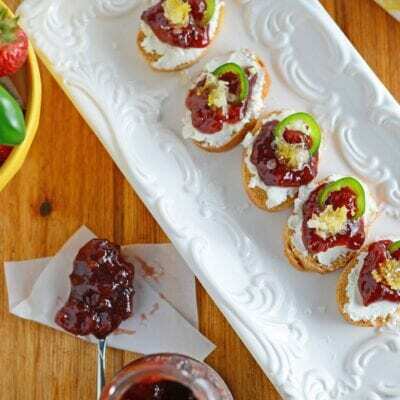 I love mascarpone cheese and love to find new recipes to use it in. Oh Yum! These potatoes look oh so yummy. this looks so tasty. I hate it when I pour in too much milk. Ugh! Yes, please, how delicious, sharing!! Mascarpone? I’ve never heard of that before.. i will have to pin this.. my husband loves jazzing up mashed potatoes. I love spicing up my mashed potatoes. I will have to try this version, for sure! I’ve just recently discovered that I don’t mind red bell peppers after avoiding them my whole life. 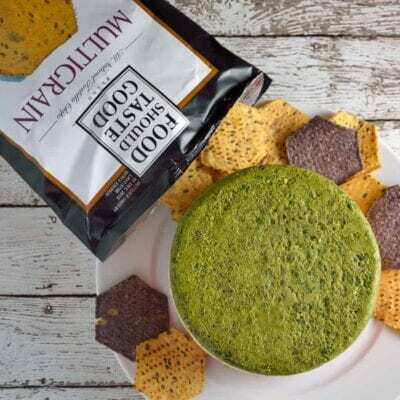 This looks like a great dish to make! What an awesome sounding side dish. I am a BIG fan of potatoes and I love new ways to make them! These look really delicious! My dad comes from a long line of potato farmers and grows all of our potatoes plus my parents and some to sell every year. I grew up with some form of potato at every meal! You have no idea how jealous I am- I LOVE potatoes and literally eat them every meal!